As an illustration of just how different the 1990s were from our current hell world, roleplaying games were steady, if not big, business. TSR was still plugging along, hitting new creative heights in their 2nd edition AD&D settings like Planescape and Dark Sun. Chaosium, hoary creators of Runequest and Call of Cthulhu, were experiencing a renaissance with new editions of their classic games. You could get jobs (with benefits!) making the groggiest of grognard games, modeling armor slopes and muzzle velocities in paper and cardboard form for companies like Avalon Hill. The landscape was littered with publishing houses churning games out, good and bad, but all yoked to a sense of endless belief that somewhere in the hobby stores and conventions you could find the future if you turned the right key. One of the most successful studios, and certainly the coolest, was down south, in Atlanta. White Wolf Publishing was setting the gaming world on fire with their World of Darkness line. You know their influence, even if you don't know the games themselves; Vampire: The Masquerade was the biggest, but not the only one, with the same general conceit—monsters are real, but hidden, and you are one of them—spread from vampires to werewolves to wizards and more. A significant part of what makes the current generation of roleplaying games feel so vibrant—its burgeoning, albeit imperfect, space for women, minorities, LGBTQ, the spaces for the political and non-traditional—was presaged by White Wolf. The company went from small studio to behemoth very quickly after Vampire came out in 1991 on the back of the design team eschewing the trappings of most roleplaying games which preceded them. They incorporated lyrics from goth and punk songs into their texts and heightened the growing sense that the 90s were just the calm before a storm so incomprehensible we could only translate it via whispered symbols of nightmares. It was the same impulse which buoyed The X-Files to its heights; we don't understand what's coming so let's pretend it's already here. White Wolf was forward thinking and desperately cool during the decade which gave us The Crow and Blade. That's why Street Fighter: The Storytelling Game is such an oddity—at the height of its powers, White Wolf did a 180 from its tragically cool horrorpunk metaverse and made a game based on the legendary fighting game. Street Fighter upended expectations of what roleplaying game combat looked like in White Wolf's unifying Storytelling system, and in tabletop RPGs at large. It was weird and unexpected. "I was writing my sections of Mage: The Ascension and every now and then to take a break I'd go over to the convenience store and play the hell out of Street Fighter," recalls Steve Wieck, Street Fighter's co-developer and former CEO of White Wolf. "So I got to be a big fan of the game. When I came back down to Atlanta to take over as CEO of White Wolf, I presented to Stewart [Wieck] and Mark [Rein-Hagen], and I said, "Look, I know this is going to sound crazy, but this game is massively popular. I'm a fan and I've always been a big fan of martial arts. I know it doesn't make sense, but I think we should try this." Co-developer Mike Tinney recalls those days in the convenience store as well. He was in charge of cooking up the rules and realized in the development process that the standard Storytelling System which powered all of the World of Darkness games wasn't going to work with the breakneck pace and simultaneous action of an arcade game world. He came up with a novel solution: Cards which you printed out with discrete moves based on your character's fighting style. You and your opponent in a fight laid down cards simultaneously, with speed ratings determining who went first. "The cards were an early concept I had for trying to capture the uncertainty of an opponent's move and the simultaneous nature the arcade game had a feel for," says Tinney. "But I can still remember we had this hallway with a grid tile on it, and we'd essentially get our butts on the floor with miniatures in the hallway, playing through iterations of the rules of that card system because the position on the board mattered. I remember making full use of that space." I can speak personally to how fun and innovative the game was in play. I have vivid memories of being huddled with friends around a pool table covered in hex maps, photocopied cards, and empty cigarette packs, waiting for my turn while poring over tournament sheets of who would fight who and when. Night after night, we played Street Fighter like a miniatures game. Nothing I've played before or since has played as cleanly, quickly, and with as much baked in fun as laying down those cards. But there was way more to it than just that part of it. The character sheet for Blanka, everyone's favorite electrically charged green Brazilian. Street Fighter: The Storytelling Game used a "dots" system similar to other White Wolf Games. / Image via Halloween Jack. It's difficult to remember now, but Street Fighter was once a nearly blank canvas. There was a world, people fought in it, some of them were really good at it, and that was about it. It's still got that vibe to it, but even as a casual fan of the series as it moved forward, I can tell there's more defined history after decades of movies, games, and anime. White Wolf got Street Fighter during the blank canvas days and they ran with it. "I recall there was a world bible, although it didn't have a whole lot beyond some character backgrounds," remembers Bill Bridges, former Werewolf: the Apocalypse developer and a writer on Street Fighter. "One of the appealing things to writers like me was that we could fill in a lot of the world." Wieck lists off the few restrictions Capcom had. "Don't change any of the main characters. There should never be a situation where they die. And when it comes to Shadowloo and any parts of the setting they basically said, well, we don't know. So we'd write things to have them approve it and they more or less said sure to what we'd done." That unleashed immense freedom for the game's writers. 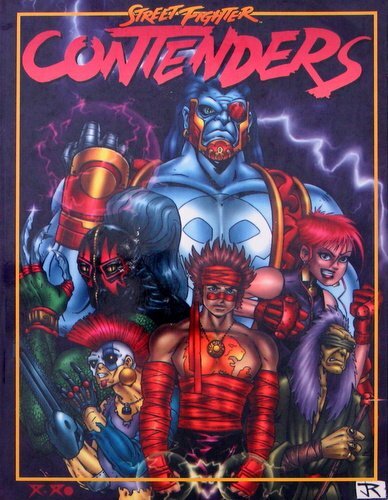 There was bad mixed in with the good—the character catalog Contenders, for instance, had some infamously weird stuff in it, while animal hybrids and cyborgs were eventually added to the mix—but even there it's an open question of whether it was any goofier than what came after. After all, a narcissistic ninja from Spain who likes claws and matador outfits is a really weird character concept but Vega is real and nobody's complaining. Or nobody should be. Tinney explains, "We were all in our early 20s and at that stage in our careers, a lot of the worldbuilding was just gut instinct." It was wide open, young, enthusiastic, and above all earnest. What linked Street Fighter to White Wolf's gothic fantasy RPGs was the terribly unfashionable sense of earnestness. White Wolf sometimes dabbled in irony, but mostly its output felt incredibly heartfelt: The world really was choking in pollution, childhood betrayed really does make you cold inside, hungering forever really does hollow you out. At any point, Street Fighter could've done the opposite, going with irony and a refusal to accept the goofiness inherent in a world of electric animal people. Today, it probably would have. The Street Fighter RPG we actually have is a marvel of straight-faced ludicrousness, the ultimate earnest martial arts movie which says that, yes, the ninjas, Thai crime ring dabbling in psychics and Soviet wrestlers should all be taken deathly seriously. It didn't last, of course. The initial publication came about through an existing relationship with Capcom, who were interested in a Werewolf video game. Street Fighter was ultimately a niche product of limited scope, with Bridges saying that he remembered it was always set to be a limited run; it's been out of print for the better part of two decades with no indication it will ever return in the PDF form which dominates the modern RPG industry. One of the enduring mysteries when revisiting Street Fighter is why the traffic between tabletop and video games is so one-way. White Wolf did Street Fighter and, later, World of Warcraft and EverQuest RPGs. R Talsorian is doing an upcoming Witcher RPG and there's a well-regarded Dragon Age adaptation, but that's really about it outside some smaller press stuff like a 90s Diablo adaptation and the still in-print Rune game. In the meantime, the tabletop-to-video game titles are practically uncountable. "How does the play experience of a computer game translate to a tabletop experience that I want to play? Let's say I wanted to make a roleplaying game for Starcraft. Well why do I like Starcraft," asks Wieck. "The reason I enjoy Starcraft as a game is the whole RTS element and the building and the rapid fire decision making. But when I go to a tabletop game that's going to be a totally different experience. What do I want out of that experience? Will the Starcraft player enjoy a different experience just because it's in the same setting? And usually it's just not worth it to try to design for that." There's something rather sad about that. Not in the sense that people should enjoy one over the other, but that it encapsulates the idea that something was lost as video games replaced their physical, face-to-face counterparts and there wasn't anything to really be done about it. Of course there are still roleplaying games, and the barriers to publication are lower than ever before. But if you want a steady paycheck with benefits via game design, it doesn't really exist in the analog space. Not anymore. The traffic from tabletop to video and digital isn't just in terms of licenses and game worlds; it's people, too, and it's the Street Fighter crew. Wieck, Bridges, and Tinney all moved on to CCP in various roles when the Eve developer purchased White Wolf. All have left, but Wieck and Tinney remain in the new world of games, one made of clouds and apps—Wieck founded Drive Thru RPG, which helped alter the game publishing forever via a push toward PDF, while Tinney has found his calling gamifying physical exercise in mobile games. Street Fighter stands as an oddity of innovative design, shrewd licensing, and wild-eyed worldbuilding. Even more, it represents the sort of gaming world which doesn't exist anymore. It wouldn't be made today, but even more, it very likely couldn't be. It's a gonzo game from a gonzo time for tabletop games: too weird to live, and too rare to die. Have thoughts? Share them over on the forums! You can follow Ian Williams on Twitter!